With new students arriving in the city before the new term, finding accommodation is top on the list of priorities for many expats in Wroclaw right now. Therefore when we were made of aware of a website charging foreigners hugely inflated agency fees, we felt it was an ideal moment to pass on some handy tips for searching for a room or flat. When accommodation hunting there are many factors to consider, most of which we covered in the accommodation guide we produced with Infolink last year. Today we'd like to expand on that useful article by telling you a few extra tips on what to look for in order to avoid getting ripped off. As more and more foreigners come to the city, it is inevitable that rental agencies will get in on the act and aim to take their slice of this growing market. Any service that helps foreigners has to be welcomed however, and if they are offering a fair service then all the better. But what if such an agency are offering flats already available through other agencies for a significantly higher fee? This is exactly the situation we came across, and the differences between prices were certainly eye opening. 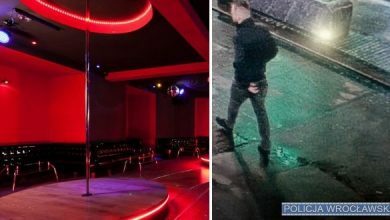 Now, before we illustrate this case it is important to stress that it is not our intention to launch the smear campaign of smear campaigns against this website. For all we know, the owners of the flats this company deal with could well have gone against their word and contacted other agents without their knowledge. The fact remains however – if you want to know if the offer is exclusive, be sure to check it is the case by searching online on popular websites such as gumtree, olx, dlastudenta, nieruchomośconline.pl, tablica.pl, domiporta, oferty.net, gratka, otodom, homebroker and others. If you like the flat enough and are willing to pay an agency fee, you could save yourself a fortune. 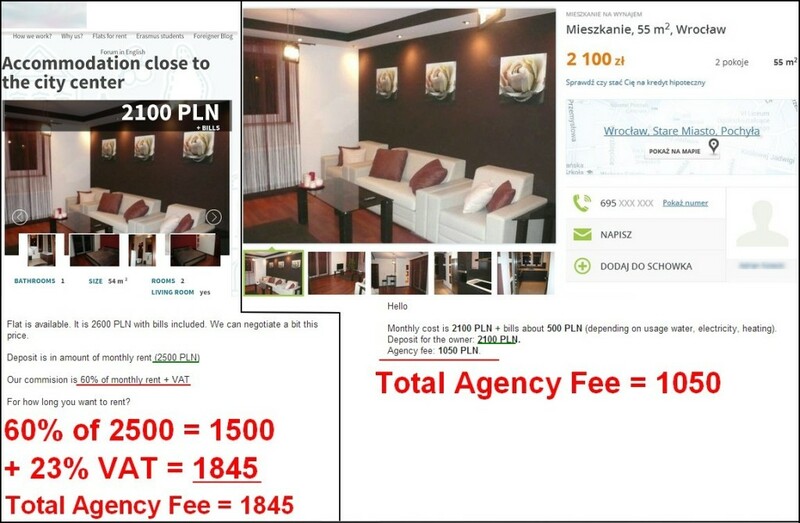 The website on the left, which is aimed at foreigners, appears to be charging 100zl extra for the monthly rent compared to the same offer listed by another agency via otodom.pl. It might not seem much at first – but that's 1200zl per year should you choose to stay there for a full 12 months. Again, the same flat listed on the website for foreigners was also listed by another agency on otodom.pl. This time however, the Polish agent mentioned they speak English – meaning they can be easily contacted for a quote. As you can see in the emails above (which we assure you are a 100% genuine), the monthly rent is defined as 2100zl, with bills coming in at 500zl. 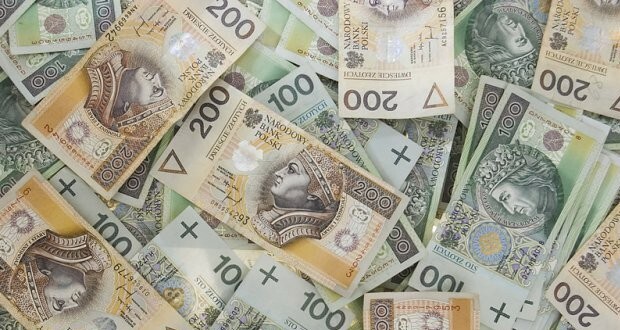 The deposit is one month's rent, excluding the added sum for bills (2100zl). The agency fee meanwhile, is 1050zl – 50% of the rent without bills. What about the fun looking website that seeks to help foreigners though? Well, as is clearly illustrated above, the monthly rent is defined here as 2500zl, with the bills costing 100zl on top of that. In the process redefining the cost of the rent, this agency have automatically increased the price of the deposit by an alarming 400zl. Things then get even worse when you consider the agency fee, which is listed as being 60% of the rent + VAT. As you can see with our calculations in red, the total sum comes to 1845zl. It was mentioned the price was negotiable – but by how much? With no negotiation, the total difference in start up costs between the two deals is a whopping 1195zl – for the same flat! Also, don't forget that the agency offering the apartment also speaks English, meaning they should in theory be able to take you through the details without any hiccups or misunderstandings. Could lightning strike a third time? We were intrigued, and it didn't take long before our source found another flat offered on both the aforementioned websites. This flat, just like the last two, was listed as having the same rental fee by both agencies. This time the agency advertising the flat on otodom.pl were contacted via phone for a quote. They explained that the 1550 figure includes the czynsz (the fee for building operation costs) and when removed, the monthly rent was 1200zl. The agent takes 50% commission from that figure, which would then of course be 600zl. Once more our source followed up by emailing the website aimed at foreigners to get their quote. 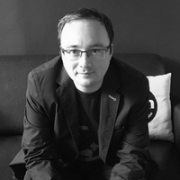 True to form, the offer was also considerably inflated compared to the one available from the agency advertising on otodom.pl. The 60% commission fee was charged for the full rent with czynsz included, which amounts to 930zl. Then once you add on the VAT (which they say is not included in the fee) the figure rises to a gigantic 1144zl! Yes, that's right, almost double the agency fee. For the same flat. With the situation repeating itself for a third time, our source replied to the foreigner focused agency to ask them if they were aware the same flats were available cheaper elsewhere. They claimed that "agencies normally charge you 100% of monthly rent. We charge only 60%. " Now, it isn't unusual for an agent to demand 100% commission – but our research found there were also plenty asking for just half that figure. In relation to the third flat listed above, the company also expressed their surprise at the flat being available elsewhere, stressing they were of the understanding that this was one of their "exclusive offers". They did also however, admit that some of their flats are available on other sites. Given those three examples, would it be fair to label this agency as rip-off merchants? We certainly won't be making such claims as those are just a mere three cases. Perhaps honest mistakes were made. You could also argue they operate in a free market and have every right to charge what they like. They do have to make a living somehow. Regardless, this example shows how important it is to keep your eyes open and how priceless it can be to have someone who can speak Polish on your behalf. So if you find a flat advertised by one agency available through another one, be sure to check you are getting the same deal. More importantly, don't hand over any cash until you've actually gone though all the details and know the flat is yours. If you have nobody to help you, go to the Infolink office and ask somebody to make an enquiry – it's what they're paid to do. In any case, most people would argue its better to avoid paying any agency fee no matter how small. It isn't that difficult to do so either – there are plenty of flats available online that owners have listed. 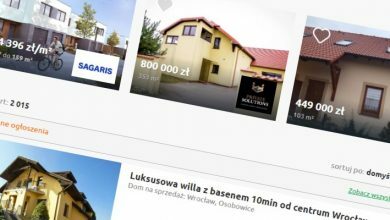 Most of the websites mentioned at the beginning of the article include an option to search for properties offered by a 'Właściciel' (owner in English). By cutting out the middle man, you've already saved yourself a tidy sum. 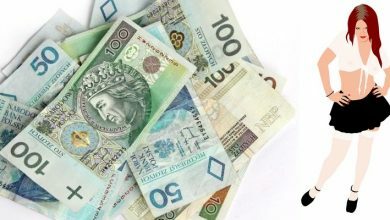 In addition, when you are weighing up the cost, don't forget to ask about added monthly costs such as czynsz and bills. This can vary quite a bit from flat to flat. What if you are looking for a room though? Again, the websites listed at the beginning of the article are your best bet. If your Polish isn't all that great, don't worry – just write in English. It is important you can communicate with the people you live with and be able to ask all the questions about the bills and contract (should you have one). You can also find plenty of offers on the Wroclaw Expats Facebook page. We certainly hope you've find this information useful. Happy flat hunting everyone!